Newport News, VA (Nov 13, 2018) – Dr. Zachary Tan, fellowship trained orthopaedic spine surgeon with Hampton Roads Orthopaedics Spine & Sports Medicine, was the first in Virginia to complete a cervical fusion using the 7D Surgical System. This system virtually replaces standard fluoroscopy, providing the surgical team with a fast, accurate and radiation-free tool for the placement of spinal implants. The 7D Surgical System is the first and only Machine-Vision Image Guided Surgery (MvIGS) platform. For the first-time spine surgeons can guide their tools to the critical anatomy using sophisticated camera technology linked to a computer in the operating theater. The underlying technology is similar to what is used in the latest self-driving automobiles. Unlike time-consuming conventional image guided surgery (IGS) systems that depend on intraoperative radiation, this new MvIGS platform can achieve an incredibly fast surgical workflow for spine procedures, reducing operative time for patients. 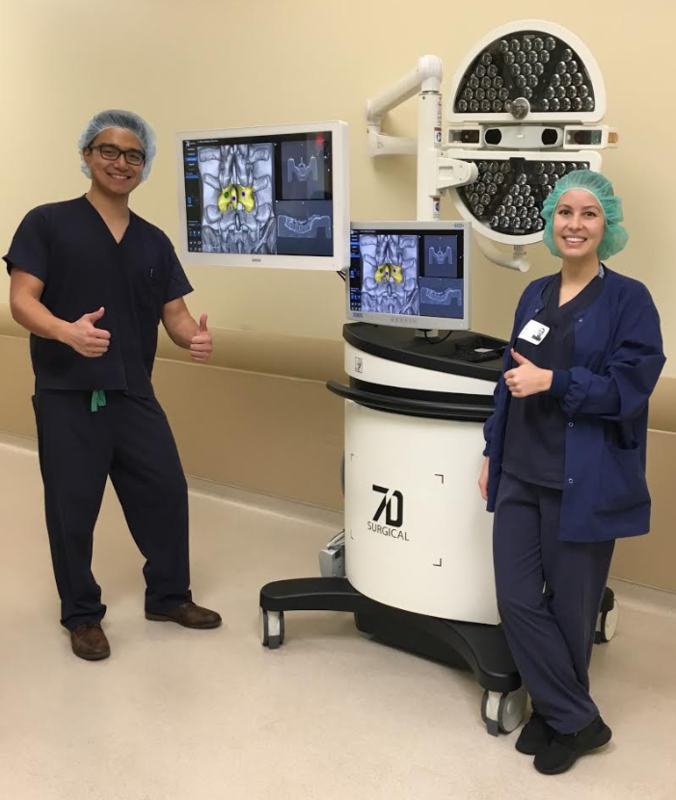 “I am proud to be able to offer my patients the very latest technology in spine surgery while eliminating the unnecessary radiation still used in many hospitals” said Dr. Zachary Tan. Hampton Roads Orthopaedics Spine & Sports Medicine (HROSM) has been providing quality orthopaedic care for more than 50 years to area residents in Hampton Roads. Originally founded by Dr. Wieman Kretz, the first orthopaedic surgeon in the area, HROSM continues to evolve to meet the demands of the ever-changing orthopaedic healthcare industry. HROSM has a team of 15 physicians in 3 convenient locations offering specialties that include: spine care, joint replacement, sports medicine, podiatry, interventional pain management, chiropractic care, and stem cell therapy. Hampton Roads Orthopaedics & Sports Medicine has onsite Physical Therapy, Workers’ Compensation Department, Urgent Care, and has the areas only open, multi-positional MRI. For more information about our philosophy of healthcare, team of physicians and locations, please go to www.hrosm.com or call 757-873-1554.